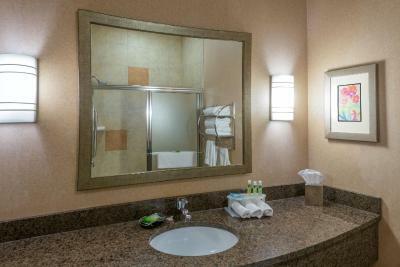 Lock in a great price for Holiday Inn Express Hotel Vernal – rated 9.2 by recent guests! The bed was clean, very comfortable, breakfast was good! Husband did get a bad milk but other than that it was great!! Will stay there again( kids live out there) we try to stay close but in a hotel! Very friendly staff, clean environment, and breakfast in the morning was great! Breakfast was great with the wonderful cinnamon rolls and eggs. Room was very comfortable; slept like a log. Everything was great, especially the lady taking care of the breakfast was friendly. Breakfast was PERFECT! Loved the room, granite in the bathroom was a bonus with a LARGE shower! Comfortable bed. Reasonable breakfast with tasty omelette and chocolate muffin. Staff very friendly & helpful Enjoyed pool & workout room.Quality breakfast provided in morning. Breakfast was great! Staff was super friendly, and helpful. 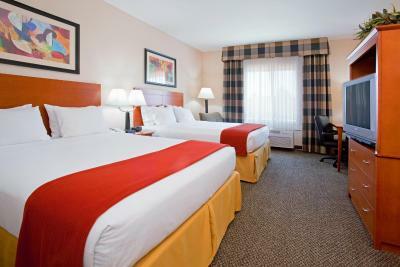 Holiday Inn Express Hotel Vernal This rating is a reflection of how the property compares to the industry standard when it comes to price, facilities and services available. It's based on a self-evaluation by the property. Use this rating to help choose your stay! This hotel, on Highway 40, is surrounded by the scenic Uinta Mountains. It features an indoor pool, hot tub and fitness center and serves a free daily hot breakfast. 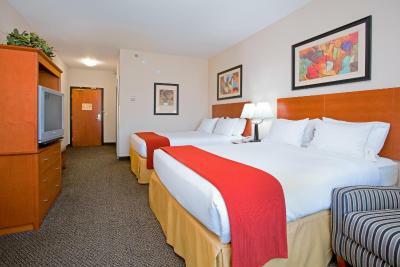 The brightly and airy guest rooms at Holiday Inn Express Hotel Vernal features a flat-screen TV with cable and free Wi-Fi. A complimentary newspaper is delivered to rooms in the morning. 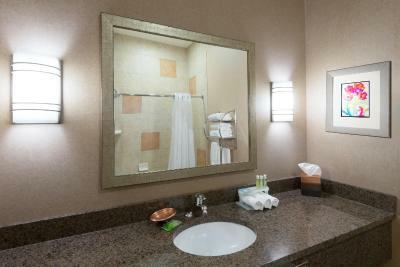 The Vernal Holiday Inn Express Hotel has both a front desk and a business center that are open 24 hours a day. An ATM and a coin laundry facility are on-site. The Vernal Regional Airport is 2 miles from Holiday Inn Express Hotel Vernal. The Utah Field House of Natural History Museum is 4 miles away. 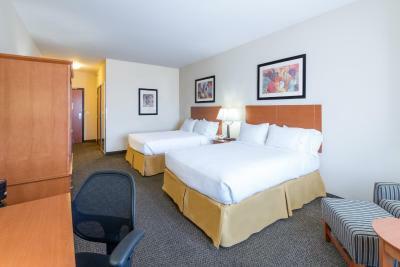 When would you like to stay at Holiday Inn Express Hotel Vernal? This air-conditioned room features a flat-screen cable TV, tea and coffee-making facilities and a private bathroom with a hairdryer. 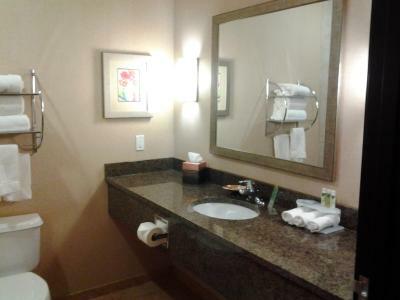 This suite features a sitting area, a flat-screen cable TV and a private bathroom. Bedding is determined upon check-in and based on availability. House Rules Holiday Inn Express Hotel Vernal takes special requests – add in the next step! Holiday Inn Express Hotel Vernal accepts these cards and reserves the right to temporarily hold an amount prior to arrival. The lady that checked us In was great and went over and above to help us! For a fairly standard overnight stop hotel we found they had very friendly, helpful staff and very efficient service. It would be nice to have a room safe. Good, clean, quiet, comfortable room. The free breakfast was pretty good! The bed was hard & pillows too fluffy. Its very clean & updated. Not the hotel's fault, but it was the only property with an odd number among all the even numbers. We drove past it twice because we were looking on the wrong side of the road! The room was large and comfortable, with a good bathroom. Pool had a lot of chemicals, but the kids still loved it.